Our House by Louise Candlish is a highly recommended novel of domestic suspense. 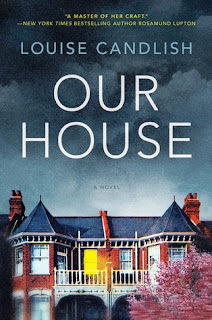 When Fiona Lawson returns to her home after being away for a few days, she is shocked to see a moving van and strangers moving into her house. As she confronts the new homeowner, it becomes increasingly clear that Bram, her estranged husband, has sold the house, pocketed the money, and is now missing. After ascertaining that her two sons are safe and staying with a grandparent, she tries to unravel what happened. The couple were separated and had a custody arrangement in place known as a "bird's nest." This arrangement is where the children always stay in the family home while the parents alternate between living there and in a shared flat. The narrative switches between Fiona telling her story to the reader and on a podcast called "The Victim," and Bram telling his side of the story via a long word document that he prefaces as a suicide letter. It is clear that Fiona has been clueless and gullible while Bram has been lying for a long time - and it is his lies that eventually result in the current situation. Both characters are pretty self-involved. Neither character is completely sympathetic, which makes them difficult to feel connected to, but they are both interesting. Our House is basically well-written, despite long, drawn-out explanations from Fiona and Bram. Their stories could have been explained and summarized on both sides much quicker. This does result in the novel being a bit longer than is completely necessary to tell the story. What transpired is not complicated enough to require quite so detailed an explanation. The novel is intriguing, however, and you will want to know what happened and why, although you may have an inkling about the reasons behind Bram's disappearance, especially as new details are eventually revealed (in his long-winded explanation). Candlish supplies some surprises and a satisfying conclusion to the drama. Disclosure: My review copy was courtesy of Penguin Publishing Group.